Saracens second row George Kruis does not want "favouritism" to be a factor if he is selected by England for their Six Nations campaign. The 25-year-old was nurtured by Steve Borthwick when the recently appointed Red Rose forwards coach was captain at the Premiership club. Sarries director of rugby Mark McCall has described Kruis as a "shoo-in" for the opener in Scotland on 6 February. "If I do get selected it would be off my own back," said Kruis. "Steve was a mentor for me definitely. When you play for five years alongside a player like that you learn a few things off him. But he is another coach and that is the way it is. "There will be no favouritism and I would not want it to be like that." Kruis has already won 10 caps, the last coming against Uruguay at the World Cup in September. 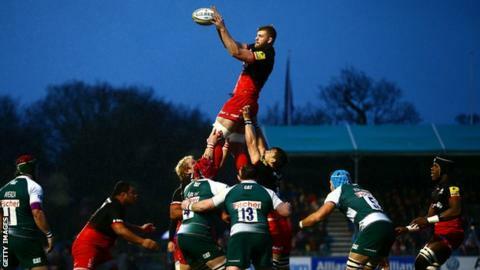 The 6ft 6in-player was named man-of-the-match in Saracens' 26-6 victory over Leicester on Saturday - a match watched by Borthwick.